The Queen has been at Balmoral for about two weeks, staying at another property on the estate while the castle was still open for visitors. Today, August 10, was her official arrival at the Balmoral Castle, and with that, we'll start our official Balmoral Holiday post for the year. As we did last year, sightings of Her Maj while on her Scottish estate will be collected here throughout her break. You can find a link for this post on the sidebar under Recently Updated Events. The link will tell you the last time the post was updated. August 15: A trip down to London for the VJ Day 70th Anniversary. August 16: Back in Scotland for church once more. So far, just a glimpse via Instagram of The Queen (no brooch visible), and a glimpse of Camilla. August 19: The Sons of Scotland Pipe Band played at Balmoral for The Queen, The Duke of Edinburgh, The Countess of Wessex, and Lady Louise Windsor. Her Majesty was in casual mode for the private performance (read: no jewels on display), but you can read all about it at The Countess of Wessex Blog. 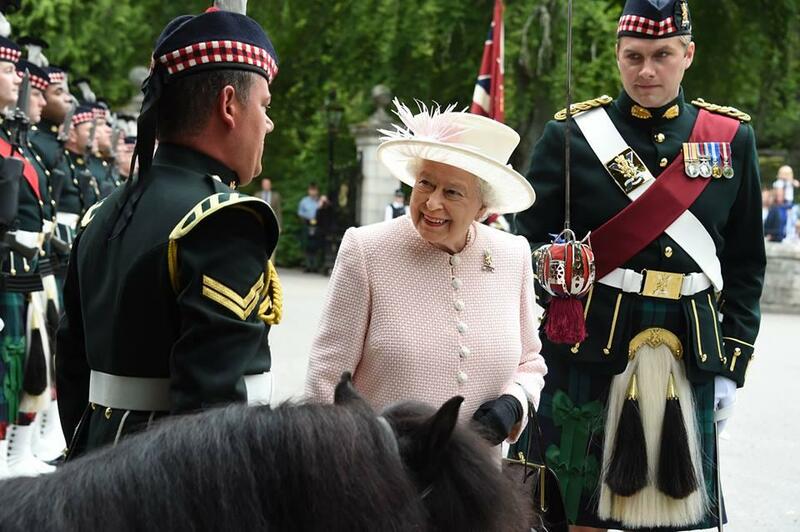 September 5: As always, The Queen attended the annual Braemar Gathering.